The Zebra P120i Card Printer System has been discontinued. No direct replacement is available. The Zebra P120i Card Printer System features double-sided card printing at an affordable price!The Zebra P120i Card Printer System is ideal for all standard ID card applications, including access control, membership and loyalty cards, staff and student identification plus gift cards. With the double-sided printing configuration crowded card designs are a thing of the past - move barcodes, signature panels and more to the back of the card, freeing up space for enlarged graphics and more content.With a 300 dpi resolution and handy USB interface, the Zebra P120i Card Printer System is highly productive and highly cost-effective. Bundle: Thermal transfer, 300 dpi, USB interface, 100 cards per hour, 16MB image memory, double-sided. Includes software, cards, ribbon, lanyards, slot punch and US power cord. Order cables separately. See accessories. 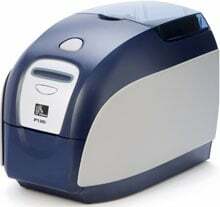 QuikCard ID Solution, Bundle, including P120i double-sided card printer with CardStudio Standard edition software, Webcam and Media Starter Kit (200 30-mil PVC cards, one full-color YMCKOK ribbon cartridge).